Should cats drink milk? Do cats need milk in their diet? We answer your questions about whether you should give your cat milk. One of the most common misconceptions is that all milk is good for cats! Milk can be high in fat, in fact one saucer of milk is the equivalent of four burgers (based on a 4.5kg cat and an average size woman) - but giving your cat ordinary cows' milk can also cause upset tummies, cramps and even severe diarrhoea. What could happen if I give my cat milk? Diarrhoea can be fatal to kittens because it dehydrates their bodies very quickly. After weaning, milk is not necessary in a cat's diet. Their ability to digest lactose (the sugar in milk) reduces. Cats can even become intolerant to ordinary cows' milk, resulting in the diarrhoea mentioned above. What can I give my cat instead of milk? Fresh, clean water is actually all cats will ever need. 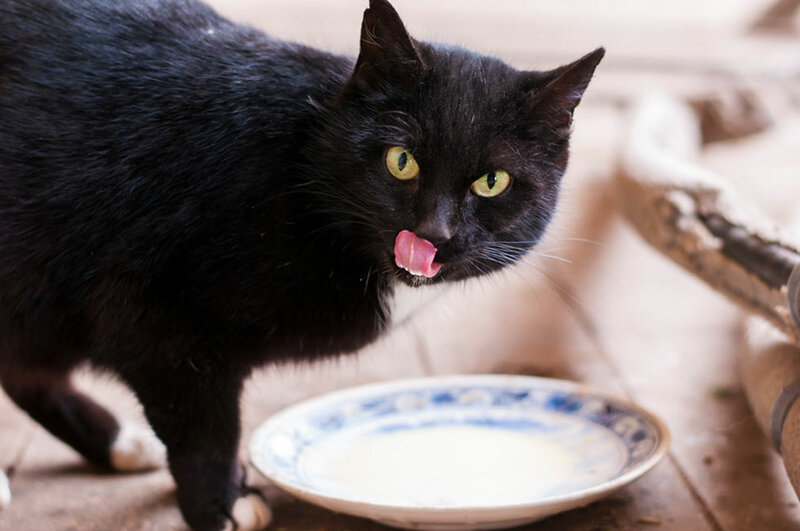 If you do wish to give your cat milk, then you can buy lactose reduced cows' milk (lactose is the sugar found in milk) from your pet food store, vets or supermarket, some even have added vitamins and minerals. So although milk is not essential in a cat's diet, some cat owners find that lactose reduced cows' milk can be a great way to give their pet a healthy treat and to help keep them hydrated. Indeed, some cats will not drink milk at all. Does my cat need the calcium from milk? Most cats are lactose intolerant because they lack the enzyme lactase, which aids in digesting lactose. As undigested lactose passes through the cat's digestive system it draws water from the intestines. Lactose cannot pass easily through the intestinal wall into the bloodstream, so it remains in the intestines. Next, gut bacteria invade and fermentation sets in causing large amounts of gas to form. The result is pain and diarrhoea for your cat. Very young kittens produce the enzyme lactase when suckling from their mother but the ability to produce the enzyme diminishes after weaning. Soft tissues such as meats (essential in a cat's diet) and offal are very low in calcium and if they are fed as the sole food source, calcium deficiency will occur. You might think that milk is the only source of calcium and the answer to this problem, but good proprietary diets will contain adequate supplies of the major and trace minerals, which includes calcium.